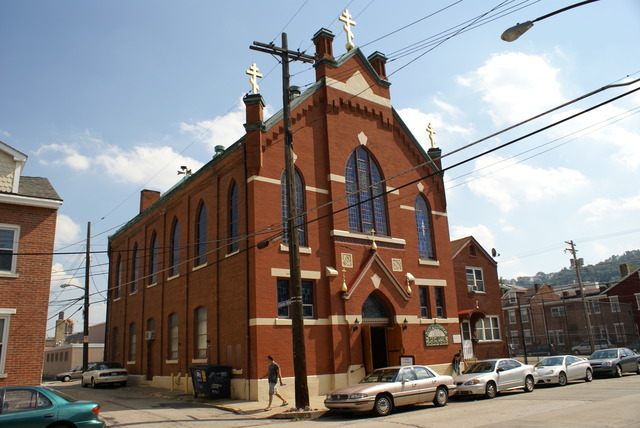 On Thursday, November 28 - Thanksgiving Day - our parish hosted the Annual Stuffed With Love Project working in conjunction with the Pittsburgh Rotary District 7300, the Pittsburgh Police and a host of other community groups to insure that every Pittsburgher in need of a Thanksgiving Dinner recieved one. 2000+ meals were prepared and delivered. All the food was cooked and prepared in our Church Hall. The Pittsburgh Police delivered all the meals. Pittsburgh's Annual Thanksgiving Stuffed With Love project hosted by our parish, assisted by the youth and yound adults of our Archdiocese, the Rotary Clubs of the greater Pittsburgh area and volunteers - all who gather to prepare Thanksgiving Dinners for thos in need. The dinners are then delivered by Pittsburgh Police and volunteers to those needing them. May God richly bless the cooks, the volunteers and Police who make this possible. ANNUAL STUFFED WITH LOVE PROGRAM were the faithful of our parish, volunteers from the Rotary and the community prepare 3200+ Thanksgiving Meals for distribution to those in need by the Pittsburgh Police. The Archdiocesan Youth Department hosted a Service Retreat in our parish to help with preparations for the Annual Stuffed With Love Project. 30 Adults and Youth came and spent hours deboning turkeys to help make 3000 Thanksgiving Dinners for delivery by the Pittsburgh police to those in need. August began a 3 stage restoration Project in the Temple. Stage 1 - remove oldpaneling install dry wall. Stage 2 - Installation of 6 Icons of life of the Theotokos. Stage 3 - Installation of scroll work along the lower walls with the Psalms on it.